Slowly but surely, Spook Central is showing its cards. Spook Central is the national security state – from the NSA to the CIA to dozens of intelligence manifestations woven through the federal government. In 2010, the Washington Post, the former crown jewel of Operation Mockingbird, the CIA takeover of corporate media, reported there were at that time 1,271 government organizations and 1,931 private companies in 10,000 locations in the United States working feverishly on the grand ruse that is counterterrorism, homeland security, and intelligence. According to the Post, the so-called intelligence community, more accurately a monolith rivaling anything created by the former Soviet Union or East Germany’s Stasi combined, in toto includes 854,000 people holding top-secret clearances. Now we learn that the CIA is “secretly” – secret because it is posted on the New York Times website – collecting financial transaction records from the likes of Western Union under the Patriot Act. This is the same law exploited by the NSA. This massive violation of the Fourth Amendment is overseen by the secret FISA court, its very existence a magnificent violation of the Constitution. There is no shortage of terrorists to go around. In 2007, the Inspector General of the Justice Department reported that the FBI’s Terrorist Screening Center database contained over 700,000 names and the list was growing at a whopping 20,000 names per month. In other words, the list now has well over a million names. So there is a lot of financial data for the CIA to sift through and pass on to the rest of the departments at Spook Central, including your local cop shop and the FBI where the CIA has long maintained a presence. The CIA has thus far “declined to confirm whether such a program exists, but said that the agency conducts lawful intelligence collection aimed at foreign — not domestic — activities and that it is subject to extensive oversight.” The intelligence committees in Congress are naturally subject to “give and take,” in other words the most secret stuff remains secret and, at best, a few vetted and trusted souls high atop the committee hierarchy are privy to the scratched surface of the national security state. Before Edward Snowden, the NSA also said it only snoops on the communications of terrorists in caves. Of course, none of this is news. It’s just that the CIA wants you to know about it now. It sort of concentrates the fear and paranoia factor on the coattails of all those numbing NSA revelations. 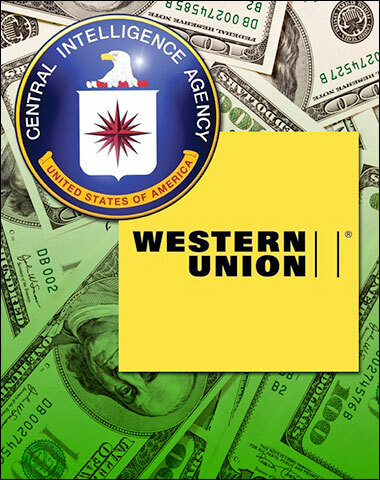 Back in 2006, when nobody really gave much of a hoot, it was discovered that the CIA was in bed with Western Union. “Western Union had twelve thousand offices across the globe, thirteen hundred in Pakistan alone. There was no country more important in battling the terrorists,” an FBI official said according to that good old thorn in the government’s side, Cryptome. Then there was all that mischievous behavior back in 1945 when military “SIGINT operatives met with representatives of the three main telegraph companies – ITT World Communications, Western Union International and RCA Global (both now part of MCI Worldcom) – starting Operation Shamrock, a 30-year illegal coordinated program to spy on the electronic communications of American citizens,” as James Bamford told The Age in 2002. The telegraph companies each night packaged up the day’s transmissions and handed them to operatives who sent them to NSA headquarters in Virginia [actually Fort Meade, Maryland] for analysis. During the Vietnam War the NSA used the information gathered to compile a watch-list (Codeword: MINARET) of more than 600 “dangerous” Americans, including folksinger Joan Baez, pediatrician Benjamin Spock, actress Jane Fonda and civil rights campaigner Dr Martin Luther King. The NSA claims in 1974 it destroyed files on more than 75,000 other Americans it illegally collected during Shamrock.